For the video game, see Kung Fu Panda 2 (video game). Kung Fu Panda 2 is a 2011 American computer-animated wuxia comedy-drama film produced by DreamWorks Animation and distributed by Paramount Pictures. [a] The sequel to 2008's Kung Fu Panda, it is the second installment in the Kung Fu Panda franchise, and was directed by Jennifer Yuh Nelson in her directorial debut. The film stars Jack Black, Angelina Jolie, Dustin Hoffman, Seth Rogen, Lucy Liu, David Cross, James Hong, and Jackie Chan reprising their character roles from the first film, with Gary Oldman, Michelle Yeoh, Danny McBride, Dennis Haysbert, Jean-Claude Van Damme and Victor Garber voicing new characters. In the film, Po and the Furious Five battle an evil white peacock king named Lord Shen who has a powerful weapon that he plans to conquer China with. Meanwhile, Po discovers a terrifying secret about his past, and discovers that Shen has something to do with it. The film was released in theaters on May 26, 2011 in Real D 3D and Digital 3D formats. Like its predecessor, Kung Fu Panda 2 received generally positive reviews, with critics praising its animation, voice acting, action scenes, musical score and character development and grossed $665 million worldwide against its $150 million budget. The film was the highest-grossing animated feature film of the year and was nominated for the 2011 Academy Award for Best Animated Feature at the 84th Academy Awards, losing to Rango. It was followed by Kung Fu Panda 3 in 2016. Lord Shen, the scion of a peacock clan that rules Gongmen City in ancient China, seeks to weaponize his family's recently invented fireworks. After discovering from the court's goat soothsayer that "a warrior of black-and-white" will defeat him if he does not change his ways, Shen leads an army of wolves to exterminate the panda population to avert the prophecy. Shen's parents are horrified by this atrocity and exile him as punishment. Thirty years later, Po is living his dream as the Dragon Warrior, protecting the Valley of Peace alongside his friends and fellow kung fu masters, the Furious Five. However, his teacher Shifu tells him that he has yet to achieve inner peace. While defending a village from wolf bandits who have been stealing metal for Shen, Po is distracted by a symbol on their leader's armor, which causes him to have a flashback of his mother and allows the wolves to escape. Po asks his goose father, Mr. Ping, about his origins; Ping reveals that he found Po as an infant in a radish crate and adopted him, but Po remains unsatisfied, wondering how and why he ended up in the valley. Shifu learns that Shen has returned to Gongmen City and killed Thundering Rhino, the leader of the kung fu council protecting the City, and is plotting to conquer China with his newly developed cannon that was forged with the stolen metal. Shifu sends Po and the Furious Five to Gongmen City to stop Shen and destroy his weapon. They find the city occupied by Shen's forces, with the two surviving council members Storming Ox and Croc imprisoned, refusing to help liberate the city due to Shen's "unstoppable" weapon. Po and the Five are discovered by the wolf boss and give chase, only to be arrested in front of Shen's tower. Upon being brought before Shen in his tower, Po and the Five escape and destroy Shen's weapon. However, Po is again distracted by a flashback upon seeing the same symbol as before on Shen's plumage, realizing Shen was there the last night Po saw his parents. This allows Shen to escape and destroy the tower with an arsenal of cannons. After Tigress demands to know why Po let Shen get away, he reveals that Shen knows something about his past and has to face him again. Though understanding, Tigress makes Po stay at the prison while she and the other Furious Five leave to stop further production of Shen's cannons. Po breaks into the factory to question Shen about his past, inadvertently foiling the Five's plan to destroy the factory and causing them to be captured. Shen claims that Po's parents abandoned him before blasting Po out of the factory with a giant cannon, where he is presumed dead. Po survives and is rescued by the soothsayer, who takes him to the ruins of the nearby village where Po was born. Guided by the soothsayer to embrace his past, Po remembers that when he was an infant, his parents had sacrificed themselves to save him from Shen's army, his mother hiding him in a radish crate and luring Shen's forces away from him. Po attains inner peace, realizing that he has lived a happy and fulfilling life despite this early tragedy. Po returns to Gongmen City to save the captive Five and prevent Shen's conquest of China. A battle ensues between Shen's armada and Po, the Five, Shifu, Ox, and Croc. Po modifies the movements used during his inner peace training to manipulate and redirect Shen's cannonballs against his own armada, destroying them. Po then urges Shen to let go of his own past, but Shen attacks Po until Shen accidentally kills himself by slashing the ropes holding up his last cannon, which falls and crushes him. Victorious, Po returns to the Valley of Peace and reunites with Mr. Ping, lovingly declaring the goose to be his father. At the same time, Po's birth father is revealed to be alive in a hidden village inhabited by surviving pandas, and senses that his son is still alive. 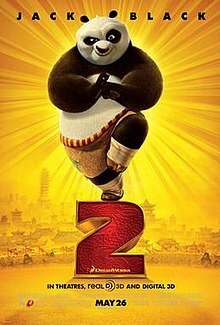 After the original Kung Fu Panda was released in June 2008, DreamWorks Animation planned a second film with the subtitle Pandamoneum, which was changed by 2010 to The Kaboom of Doom before simply being retitled to Kung Fu Panda 2. Jennifer Yuh Nelson, who was head of story for the first film, was hired to direct the sequel. The original film's cast members reprised their voice roles. Like every DreamWorks Animation film from Monsters vs. Aliens onward, Kung Fu Panda 2 was produced in DreamWorks' stereoscopic 3-D technology of InTru 3D. Jonathan Aibel and Glenn Berger, screenwriters and co-producers for the first film, returned to write and co-produce the sequel, with Charlie Kaufman consulting on the screenplay early on in the development process. In Kung Fu Panda 2, the production crew showed increased familiarity with Chinese culture. In 2008, after the release of Kung Fu Panda, DreamWorks CEO Jeffrey Katzenberg and other DreamWorks members including production designer Raymond Zibach and director Jennifer Yuh Nelson visited the city of Chengdu, which is considered as the "panda hometown". In addition to seeing real pandas at the Giant Panda Research Centre, the production designer crew members learned about the local culture. Katzenberg has stated that the sequel incorporates many elements of Chengdu in the film. The film's landscape and architecture also found inspiration from those found at Mount Qingcheng, a renowned Taoist mountain. In an interview with the China Daily, Zibach recounted that the Panda research center influenced the movie in a big way, as did their experience of holding a month old panda cub named A Bao, which gave the idea for baby Po in a flashback. It also gave them the idea of featuring Sichuan Food like Mapo toufu and Dandan noodles. In an interview with Movieline, Berger stated that "we never really thought of this as a movie set in China for Americans; it's a movie set in an mythical, universalized China for everyone in the world." Kung Fu Panda 2 was screened at the 2011 Cannes Film Festival in early May before its commercial release. In the United States, it premiered on May 22, 2011, at Grauman's Chinese Theatre, in Hollywood, California. The film was widely released in the United States on May 26, 2011, in the United Kingdom on June 10, 2011, and in Australia on June 23, 2011. It was also released in IMAX theaters in the EMEA region. The film was released on DVD and Blu-ray on December 13, 2011, accompanied with the short film Kung Fu Panda: Secrets of the Masters and an episode of the Kung Fu Panda: Legends of Awesomeness television series. On the review aggregator site Rotten Tomatoes, the film has an approval rating of 81% based on 169 reviews, and an average rating of 6.9/10. The site's critical consensus reads, "The storyline arc may seem a tad familiar to fans of the original, but Kung Fu Panda 2 offers enough action, comedy, and visual sparkle to compensate." On Metacritic the film has a weighted average score of 67 out of 100 based on 31 critics, indicating "generally favorable reviews". Variety called the film "a worthy sequel that gets an extra kick from the addition of dynamic 3D fight sequences," while The Hollywood Reporter similarly praised the film. Roger Ebert gave the film 3.5 out of 4 stars, praising the sequel as superior to the original and as an ambitious extension of the previous story. Some critics noted the influences of executive producer Guillermo del Toro's works in the film's darker themes, and Jim Tudor of TwitchFilm.net describes that with del Toro on board, the film "effectively probes deeper into Po's emerging hero's journey and personal issues, evoking a truly fulfilling Campbellian archetype, but also remains fully viable as mainstream entertainment suitable for all ages." As with the first film, the animation has been praised. Frank Lovece of Film Journal International describes the film as "truly beautiful to behold" and states it "works on both aesthetic and emotional levels". Betsy Sharkey of the Los Angeles Times writes that "For Panda 2 is not just wall-to-wall animation, it is artistry of the highest order." Many critics praised Gary Oldman for his voice acting and developed characterization of Lord Shen, with some comparing him favorably to Ian McShane's voice performance as Tai Lung in the original film, with Angie Errigo of Empire Magazine calling him "fabulous as the feathered fiend and his character animators do his performance proud with a stunning, balletic fighting style, the fan tail flicking with lethal fascination." Kyle Smith of the New York Post said, "It's a bit hard to be terrified of a peacock (the snow leopard in the first movie was way more sinister). But the animators are in charge, and they succeed in dazzling with Lord Shen's look." The film grossed $165.2 million in the United States and Canada, along with $500.4 million in other territories for a worldwide total of $665.7 million. In total, 3D contributed approximately 53% of the film's worldwide gross. Worldwide, it is the highest-grossing 2011 animated film and the sixth highest-grossing film of 2011. Overall, it is the 14th highest-grossing animated film and the 69th highest-grossing film. On its first weekend, it earned $108.9 million worldwide, ranking third behind Pirates of the Caribbean: On Stranger Tides and The Hangover Part II. It was the highest-grossing film directed by a woman until Frozen two years later, as the well as the highest-grossing film directed solely by a woman until 2017's Wonder Woman. In North America, the film earned $5.8 million on its opening day (Thursday, May 26, 2011), ranking second behind The Hangover: Part II. On Friday, the film earned $13.1 million, which was behind the original's $20.3 million opening Friday. Over the three-day weekend (Friday-to-Sunday), the film earned $47.7 million, which was behind the original's $60.2 million debut. The film went on to make $13.2 million on Memorial Day, bringing its 4-day weekend to $60.9 million. Outside North America, the film debuted with $55.5 million on the same weekend as its North American debut, topping the box office in nine out of eleven countries in which it was released. It ranked third overall behind Pirates of the Caribbean: On Stranger Tides and The Hangover Part II. The film topped the box office outside North America on two consecutive weekends (its third and fourth weekend). In China, its highest-grossing market after North America, two different grosses were reported, one a $19.3 million two-day weekend and the other a $16.7 million two-day weekend. Either way, the film set an opening-day record in the country. It earned $93.19 million in total, making it the highest-grossing animated film released in China, surpassing previous record-holder Kung Fu Panda ($26 million). It held the record until 2015, when it was surpassed by Chinese Monkey King: Hero Is Back. The Asian-themed film scored the largest opening weekend for an animated film in Malaysia, the Philippines, Singapore, in South Korea and Thailand. It became the highest-grossing film released in Vietnam, surpassing Avatar. DreamWorks Animation has invested $100 million in creating promotional partners and building up marketing for its films. For Kung Fu Panda 2, DWA has partnerships with McDonald's, AT&T, Best Buy, General Mills (cereals), Sun-Maid (raisins), Airheads (candy), Hint Water and HP. The film's characters are used in products and advertising campaigns across various media. The studio is also pursuing social media efforts to promote the film. DWA partnered with House Foods America to brand its products, notably tofu, with advertising of the film. Variety reported that the partnership was the first-ever between a film studio and a tofu company. The studio also enlisted the parade balloon of Po from the Macy's Thanksgiving Day Parade to tour in six cities, concluding with Los Angeles over Memorial Day weekend in late May 2011. Merchandise was also produced for the film: Fisher-Price (toys), THQ (video games), Hallmark (cards), and Jem Sportswear (apparel). Publishers VTech, Penguin Books, Dalmatian Press, and Ape Entertainment released books tied to the film. Kung Fu Panda 2 is the soundtrack of the film of the same name, collaboratively scored by Hans Zimmer and John Powell and originally released on May 24, 2011. A video game adaptation of the film was developed by Griptonite Games and published by THQ on May 23, 2011. The game was released for PlayStation 3, Xbox 360, Wii and Nintendo DS platforms. The plot takes place after the events of the film, and features Po and the rest of the Furious Five troubled by an evil group of Komodo dragon mercenaries. With the help of the other kung fu masters, Po has to uncover the plot behind this siege and put a stop to it. A sequel, Kung Fu Panda 3, was released on January 29, 2016. It was directed again by Jennifer Yuh Nelson, and was produced in co-production with the Chinese-American studio Oriental DreamWorks. DreamWorks Animation CEO Jeffrey Katzenberg said back in 2010 that perhaps the series could see three more sequels after Kung Fu Panda 3, bringing it to a six-film series. Beside the main films, Kung Fu Panda franchise also consists of three short films Kung Fu Panda: Secrets of the Furious Five, Kung Fu Panda Holiday Special and Kung Fu Panda: Secrets of the Masters. A television series titled Kung Fu Panda: Legends of Awesomeness aired on Nickelodeon from September 19, 2011 to June 29, 2016. The show ran for three seasons and had a total of 78 episodes. ^ Kaufman, Amy (May 25, 2011). "Movie Projector: Memorial Day weekend to soar with Hangover, Kung Fu Panda sequels". Los Angeles Times. Retrieved May 27, 2011. ^ a b "Kung Fu Panda 2". Box Office Mojo. Amazon.com. Retrieved September 12, 2011. ^ a b Rebecca Ford (April 14, 2015). "'Kung Fu Panda 3' Release Date Moves Up Two Months". The Hollywood Reporter. (Prometheus Global Media). Retrieved April 15, 2015. ^ Fiona (October 1, 2008). ""Kung Fu Panda" Sequel "Pandamonium" In 3D". FilmoFilia. ^ "Kung Fu Panda 2: The Kaboom of Doom". Budomate. September 11, 2010. ^ Siegel, Tatiana (October 1, 2008). "Kung Fu Panda bears 3-D sequel". Variety. ^ Enk, Bryan (May 14, 2010). "Charlie Kaufman Working on Kung Fu Panda 2 Script". Blog.moviefone.com. Retrieved August 15, 2011. ^ Ryan, Mike. "Which Kung Fu Panda 2 Jokes did Charlie Kaufman Write?". Vanity Fair. Retrieved August 15, 2011. ^ "Jonathan Aibel & Glenn Berger Talk Kung Fu Panda 2 & Their Plans For King Lear-Like Candyland". Blogs.indiewire.com. Archived from the original on September 27, 2011. Retrieved August 15, 2011. ^ 来自大熊猫故乡的问候 (in Chinese). Sohu.com. Retrieved May 29, 2011. ^ ""功夫熊猫2"融入更多中国元素 – Kong Fu Panda 2 incorporates more Chinese elements" (in English and Chinese). Thinking Chinese. Retrieved May 29, 2011. ^ "Kung Fu Panda 2 to hit silver screen in China". China Daily. Retrieved August 15, 2011. ^ Yu Wei, Zhang (28 October 2011). "The bear essentials". China Daily. Retrieved 22 January 2018. ^ "Kung Fu Panda 3 Shows Scenes of Qingcheng Mountains". Go Chengdu. 19 January 2016. Retrieved 22 January 2018. ^ Collett-White, Mike (May 12, 2011). "Jolie, Black seek "inner peace" in Kung Fu Panda 2". Reuters. ^ Gelt, Jessica (May 23, 2011). "'Kung Fu Panda 2' movie premiere: Jack Black, Angelina Jolie, Dustin Hoffman, Seth Rogen laugh it up (Video)". Los Angeles Times. Retrieved September 27, 2014. ^ "The Hilarious Global Smash Hit Kung Fu Panda 2 Becomes the Most Awesome Holiday Gift Pack on Blu-Ray™ and DVD Tuesday, December 13th". DreamWorks Animation via PRNewswire. October 4, 2011. Retrieved October 5, 2011. ^ "Kung Fu Panda 2 (2011)". Rotten Tomatoes. Fandango Media. Retrieved March 21, 2018. ^ "Kung Fu Panda 2 Reviews". Metacritic. CBS Interactive. Retrieved May 25, 2011. ^ DeBruce, Peter (May 22, 2011). "Kung Fu Panda 2". Variety. ^ McCarthy, Todd (May 22, 2011). "Kung Fu Panda 2: Review". The Hollywood Reporter. ^ Ebert, Roger. "Kung Fu Panda 2". Chicago Sun-Times. Retrieved May 28, 2011. ^ Uhlich, Keith (May 24, 2011). "Kung Fu Panda 2: The second entry in the DreamWorks franchise turns on the dark". Newyork.timeout.com. Retrieved August 15, 2011. ^ Matthijs, Niels. "Kung Fu Panda 2 Review". Twitchfilm.com. Archived from the original on August 28, 2011. Retrieved August 15, 2011. ^ Lovece, Frank. "Film Review: Kung Fu Panda 2". Film Journal International. ^ Sharkey, Betsy (May 26, 2011). "Movie review: 'Kung Fu Panda 2'". Los Angeles Times. ^ "Empire's Kung Fu Panda 2 Movie Review". Empire. Retrieved August 15, 2011. ^ Smith, Kyle (May 26, 2011). "Kung Fu Panda 2 film has superb animation, great third act". New York Post. Retrieved August 15, 2011. ^ "DreamWorks Animation's CEO Discusses Q3 2011 Results - Earnings Call Transcript". Seeking Alpha. October 26, 2011. Retrieved October 31, 2013. In total, 3D contributed approximately 53% of Kung Fu Panda 2's worldwide gross and this was even without the benefit of IMAX. ^ "2011 WORLDWIDE GROSSES". Box Office Mojo. Retrieved December 30, 2011. ^ "Worldwide Openings". Box Office Mojo. Retrieved June 1, 2011. ^ Gray, Brandon (May 27, 2011). "Hangover 2 Rocks Thursday". BoxOfficeMojo.com. ^ Barrett, Annie (May 28, 2011). "Box office update: 'The Hangover Part II' adds another $30 mil on Friday". Insidemovies.ew.com. Retrieved August 15, 2011. ^ Barrett, Annie (May 29, 2011). "Box office update: The Hangover Part II parties on with $86.5 mil 3-day weekend". Entertainment Weekly. Retrieved August 15, 2011. ^ Barrett, Annie (May 30, 2011). "Box office report: The Hangover Part II rules record Memorial Day weekend with $105.8 mil". Entertainment Weekly. Retrieved August 15, 2011. ^ Brandon, Gray (May 31, 2011). "Around-the-World Brief: 'Pirates' Booty Grows, 'Hangover,' 'Panda' Sequels Open Strongly". Box Office Mojo. Retrieved June 1, 2011. ^ "Around-the-World Brief: Panda Topples Mighty Pirates". Box Office Mojo. Retrieved June 12, 2011. ^ "Around-the-World Roundup: Panda Victorious Again". Box Office Mojo. Retrieved June 22, 2011. ^ Landreth, Jonathan (June 5, 2011). "Kung Fu Panda 2 Sets Chinese Box Office Records". The Hollywood Reporter. Archived from the original on March 9, 2012. Retrieved June 14, 2011. ^ "China Weekly Box Office (5/23 – 5/29): Kung Fu Panda 2 scored the biggest opening day ever". Box Office Follower. Archived from the original on March 9, 2012. Retrieved December 31, 2011. ^ "China Weekly Box Office (07/04 – 07/10): Wu Xia had a relatively disappointing start". Box Office Follower. Archived from the original on November 22, 2011. Retrieved December 31, 2011. ^ Amidi, Amid (July 26, 2015). "Breaking: 'Monkey King' Breaks Chinese Record, Surpasses 'Kung Fu Panda 2'". Cartoon Brew. Retrieved July 26, 2015. ^ Gray, Brandon (May 31, 2011). "Around-the-World Roundup: 'Pirates' Booty Grows, 'Hangover,' 'Panda' Sequels Open Strongly". Box Office Mojo. Retrieved March 9, 2012. ^ Gray, Brandon (June 6, 2011). "Around-the-World Roundup: 'Pirates' Out-Class 'X-Men'". Box Office Mojo. Retrieved March 9, 2012. ^ "Kung Fu Panda 2". Box Office Mojo. Retrieved June 30, 2011. ^ "Phim Hollywood thắng lớn tại Việt Nam". Thanh Niên. Retrieved June 27, 2011. ^ Kilday, Gregg (February 10, 2012). "'Puss in Boots,' 'Kung Fu Panda 2' Give DreamWorks an Oscar Double Hitter". The Hollywood Reporter. Retrieved December 28, 2014. ^ Cornet, Roth (December 23, 2011). "'The Artist' leads with 9 Alliance of Women Journalists nominations". HitFix. Retrieved December 28, 2014. ^ Pon, Steve (December 5, 2011). "'Kung Fu Panda 2' Tops Annie Award Nominations". The Wrap. Retrieved December 28, 2014. ^ Tapley, Kristopher (February 5, 2012). "'Rango' wins big at the 39th Annie Awards". HitFix. Retrieved December 28, 2014. ^ "2016 BTVA Voice Acting Awards". BehindTheVoiceActors.com. Retrieved February 16, 2018. ^ Hammond, Pete (December 13, 2011). "'Hugo' & 'The Artist' Lead Critics Choice Movie Award Nominations With 11 Each". Deadline. Retrieved December 28, 2014. ^ Grosz, Christy (January 20, 2012). "Sound editors nominate films". Variety. Retrieved December 28, 2014. ^ Tapley, Kristopher (January 2012). "13th Annual Golden Tomato Awards". Rotten Tomatoes. Retrieved March 15, 2016. ^ Tapley, Kristopher (January 5, 2012). "'Descendants' Leads With Denver Critics Nods". HitFix. Retrieved December 28, 2014. ^ Marmaduke, Lauren (December 14, 2011). "The Houston Film Critics Society's Best (and Worst) of 2011". Houston Press. Retrieved December 28, 2014. ^ Schillaci, Sophie (February 16, 2012). "Taylor Swift, Tim Tebow, Johnny Depp Land Nickelodeon Kids' Choice Award Noms". The Hollywood Reporter. Retrieved December 28, 2014. ^ Knegt, Peter (January 3, 2014). "'The Tree of Life' Leads Online Film Critics Society Awards". Indiewire. Retrieved December 28, 2014. ^ Schillaci, Sophie (January 11, 2012). "People's Choice Awards: The Winners". The Hollywood Reporter. Retrieved December 28, 2014. ^ Kilday, Gregg (January 3, 2012). "Producers Guild Nominates 10 Movies From 'The Artist' to 'War Horse'". The Hollywood Reporter. Retrieved December 28, 2014. ^ Lodge, Guy (December 12, 2011). "'The Artist' (what else?) leads with 8 San Diego film critics nominations". HitFix. Retrieved December 28, 2014. ^ Lodge, Guy (December 2, 2011). "Satellite Award nominations topped by 'War Horse'... and 'Drive'". HitFix. Retrieved December 28, 2014. ^ Cornet, Roth (March 1, 2012). "Saturn nominees feature 'Captain America,' 'Harry Potter,' 'Hugo,' 'Ghost Protocol,' 'Super 8' and 'Tintin'". HitFix. Retrieved December 28, 2014. ^ Tapley, Kristopher (December 12, 2011). "'The Artist' and 'Drive' lead with St. Louis critics". HitFix. Retrieved December 28, 2014. ^ Rowles, Dustin (August 8, 2011). "The Teen Choice Awards and How Today's Teenagers Really Aren't That Much Dumber than Teenagers in 1992". Pajiba. Retrieved December 28, 2014. ^ Kilday, Gregg (January 9, 2012). "'The Adventures of Tintin' Earns Six Nominations From Visual Effects Society". The Hollywood Reporter. Retrieved December 28, 2014. ^ "'Iron Lady' and 'Kevin' Top Women Film Critics' Awards". Indiewire. December 19, 2011. Retrieved December 28, 2014. ^ a b c Graser, Marc (April 25, 2011). "DreamWorks inflates Kung Fu Panda campaign". Variety. ^ "Kung Fu Panda 2 Soundtrack (2011)". Soundtrack.Net. Retrieved October 13, 2014. ^ "Kung Fu Panda 2". Varèse Sarabande. Archived from the original on March 29, 2012. Retrieved March 28, 2012. ^ DreamWorks Animation (April 9, 2013). "DreamWorks Animation Packs A Powerful Punch With New Cast Additions For Kung Fu Panda 3" (Press release). PR Newswire. Retrieved January 30, 2014. ^ "Rising Dreams in the Orient: Oriental DreamWorks To Establish Headquarters in Xuhui". DreamWorks Animation. August 6, 2012. Archived from the original on December 8, 2012. Retrieved August 7, 2012. ^ O'Hara, Helen (December 3, 2010). "Katzenberg Talks DreamWorks Sequels". Empire. Retrieved September 7, 2011. Wikimedia Commons has media related to Kung Fu Panda 2 premiere in Sydney.